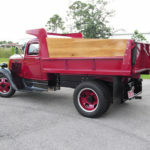 The owner of this 1936 Dodge Dump performed a really nice 3 1/2 year frame off restoration. 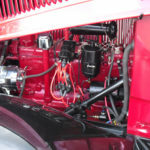 They swapped out the original engine with a rebuilt 1952 Dodge 251 CI flathead. 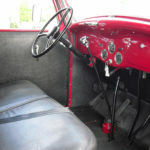 Backing up the flatty is the original 4 speed transmission and rear end. A 12 volt electrical system now powers the truck. Headlights were converted to halogen bulbs and turn signals. 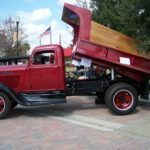 This old dump truck is very clean and has won many awards.